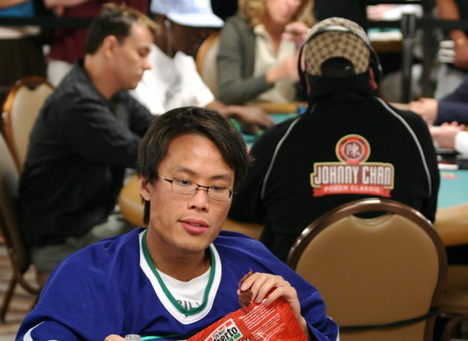 Terrence Chan, the 26-year-old, Vancouver poker pro who famously is not Johnny Chan, finished second yesterday in the $2500 No Limit Hold ’em short-handed event (the same event that saw Vinnie Vinh‘s chair finish 22nd). The former PokerStars customer support manager found himself heads-up for the bracelet against Hoyt Corkins, the Alabama cowboy whose last name sounds like something that happens to pretty boys like us in prison. After about 20 hands, Chan got all his chips in with Ad-4d against Corkins’ Kd-10s. The turn paired Corkins’ king, and Chan had to settle for runner-up and a $287,345 cash. Corkins earned his second WSOP bracelet and $515,065. This is Terrence Chan’s biggest tournament cash, surpassing the $74,175 he banked for his 8th place finish in the $2500 NLHE event at last year’s WSOP. For what happens when you lose 400 pounds go here. Runner, Runner Goes With Bloch and Furst: Will You See It?